The common claim by Blair’s supporters that Bush would have invaded Iraq whether Blair had supported the war or not was disproven by polls of Americans before the invasion, which consistently showed around 60% opposed to the US invading Iraq without the support of its allies, while 60 to 80% were in favour if allies supported or participated in the invasion (1). Bush simply could not have got public support for an invasion if none of the US’s key allies supported the decision and none sent troops – and would practically have guaranteed himself a single term Presidency if he’d invaded without the support of the majority of Americans. 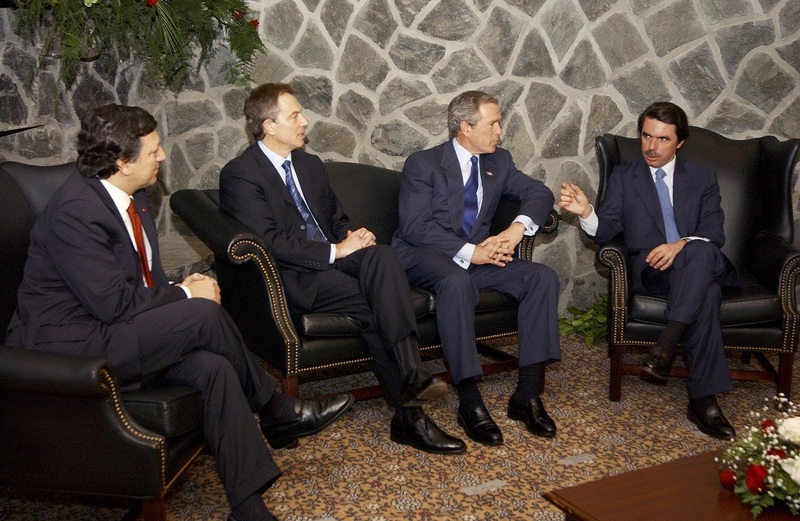 The support of the British government under Blair, the Australian government under Michael Howard, the Spanish under Aznar and the Portugese government gave Bush enough long established allies supporting the invasion to point to to get public backing. 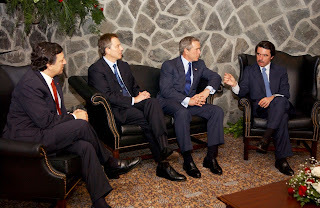 That’s why Bush held a televised joint press conference with the three main western European Prime ministers who backed the war 4 days before the invasion (2). This makes David Milliband’s recent claim that Bush was “the worst thing that ever happened to Tony Blair” even more ridiculous. British Prime Ministers do not have to do whatever whoever currently happens to be President of the United States says they should do. Blair had the choice of what to do and chose to parrot Bush and Cheney’s and Rumsfeld’s lies and get British troops and Iraqi civilians killed and tortured in a war that cost many lives but saved not one. Senior Labour MPs still talking as though they must do whatever the US government tells them to do suggests any future Labour government could have all the faults Blair’s did (3). Milliband went on to add another ridiculous claim – that the NATO intervention in Kosovo “saved a lot of lives”. In fact it involved bombing from such high altitudes that it mistakenly killed many of the Albanian refugees it was supposed to protect (4) – (6). It also involved targeting civilian targets like party headquarters, television stations and the centres of towns and bridges on market days in Serbia, killing hundreds of Serb civilians in addition (7) – (11) . It did have one effect – while before NATO ground forces went in more Albanian civilians were being killed or forced out of their homes by Serb forces or militias than Serb civilians killed by the KLA, afterwards it was mostly Serbian civilians in Kosovo killed or ethnically cleansed by the KLA (who include plenty of terrorists, drug runners and kidnappers; and who were classified by the US state department as a terrorist organisation until shortly before the Kosovo war) (12). The KLA also disappeared at least 2000 people after the war, mostly Serbs, many having had their organs removed to sell on the black market (13). When the Blairites can’t even face the truth about their past actions and their effects, how can we possibly trust their judgement to deal with current or future ones? Calling them ‘Walter Mitty types’ (their usual insult for people who disagreed with them, including Dr Kelly) would be an understatement, because Walter Mitty didn’t regularly get large numbers of people killed.